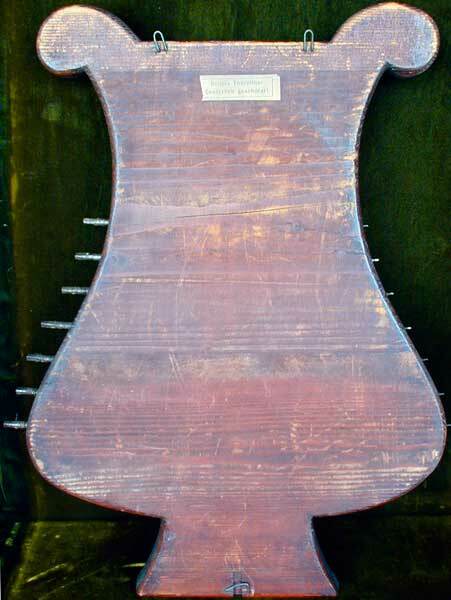 English Guitar with Keyboard bearing the original stamp on the back of the peg head: Longman & Co., No 260 Heapside, London. Spruce top with several repaired cracks and painted purfling, stained maple and bone and ebony rosette, flamed maple back with several repaired cracks and painted purfling, flamed maple sides with several repaired cracks, flamed maple neck and scroll, scroll with a mother of pearl and tortoise shell inlay, brass enclosed machine heads stamped M, ebony finger board with ebony nut and 12 brass frets, key board box made of maple and pine with bone keys with a stamp Longman Smith Patent Box, maple bridge probably non original, total length 68.6 cm, scale 42 cm, width 29 cm, depth at the neck joint 5.8 cm, depth at the bottom 7.5 cm, nut 4.6 cm. 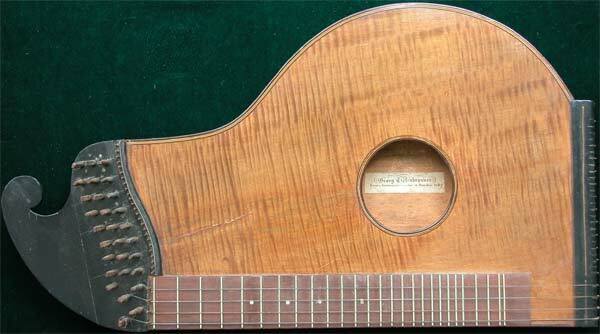 English Guitar stamped on the back of the head: Preston maker London. Spruce top with repaired hairline crack at the bottom (7 cm), top with ebony and fruit wood purfling, brass rosette with an bone ring around it, flamed maple back with one repaired hairline crack (30 cm), back with painted purfling, flamed maple sides in good condition, maple neck and head with brass enclosed machine head, machine head stamped: Preston Inventor, the top of the head has been repaired, ebony finger board covered with tortoise shell and mother of pearl with an bone nut and 12 brass frets, brass and ebony capo, ebony and bone bridge, total length 69 cm, scale 43 cm, width 29 cm, depth at the neck joint 5.4 cm, depth at the bottom 7.4 cm, nut 4.7 cm. 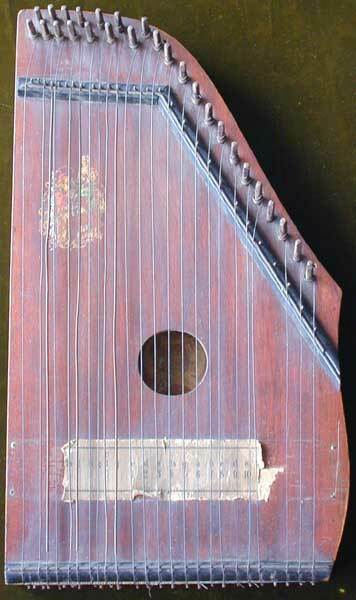 A rare South German or Swiss Halszither, Neck Cittern, name is not readable, only the date 1838. Pine top with one repaired crack (14 cm), the rosette probably from blackened parchment, fruitwood back and sides painted in a sponge like technique, back has two repaired cracks (16 cm, 11 cm) also is coming off the rim at the bottom, the rim the same wood and paint with some repair at the bottom, neck and peg head of strained fruit wood with a carved animal head, 10 wooden pegs some might be original, stained fruitwood finger board with an ivory or bone nut and14 brass frets and an original adaptor made from fruitwood and metal, the bridge a later replacement, total length 86 cm, scale 51 cm, width 29.5 cm, depth 7 cm, nut 5 cm. A nice Swiss cittern bearing the original label: Alois Suter, Näfels anno 1879. Spruce top with pretty flower decoration above the sound hole and one repaired crack at the bottom of the finger board (9 cm), flamed maple back and sides, probably stained fruitwood scroll, bridges and fingerboard, 3 melody strings, 8 sympathetic strings, bone bridge saddle and pins, also 2 round bone inserts at the scroll. Measurements: - total length 63 cm - scale 39 cm - width 33 cm - depth 5.6 cm. 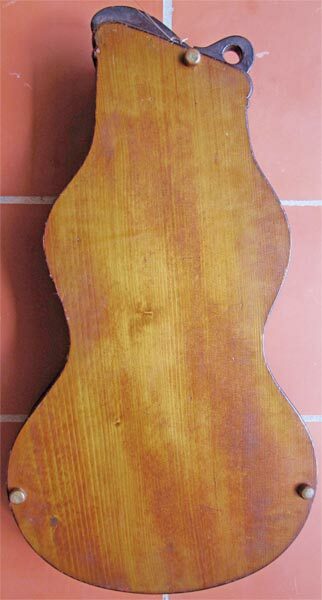 An English Guitar stamped on the back of the head and the top of the back: R. Liessum. Spruce top with several repaired hairline cracks and painted purfling, on the right side of the top there is an edge repair (7 cm), wooden carved rosette, flamed maple back with two repaired hairline cracks (1 cm, 5 cm), flamed maple sides in good condition, flamed maple neck and peg head, top of the head bone and ebony inlay, 10 non original ebony pegs, ebony finger board with an bone nut and 17 brass frets, ebony and brass capo, ebony bridge, total length 72 cm, scale 41.5 cm, width 30 cm, depth at the neck joint 6.7 cm, depth at the bottom 7.3 cm, nut 4.5 cm. 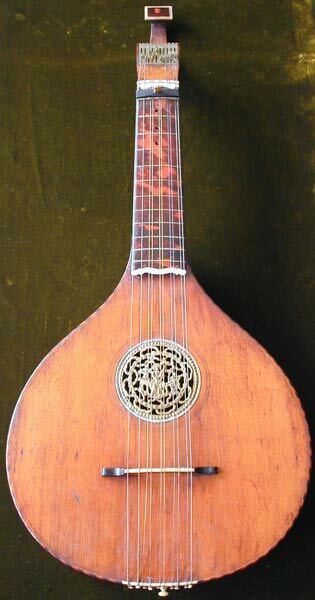 A Bass Lute, Stössel-Baßlaute, bearing the original label: Stössel, D. R. P. 296436, D. R. G. M. 646393, Geschm. 2288, Made in Germany. Pine top, mahogany back and sides, 7 treble strings, 13 bass strings with metal pegs, rosewood fluted finger board with one zero fret and 5 frets, rosewood bridge and an ebony bridge, total length 54 cm, scale 34.2 cm, width 30.8 cm, depth 6.8 cm. 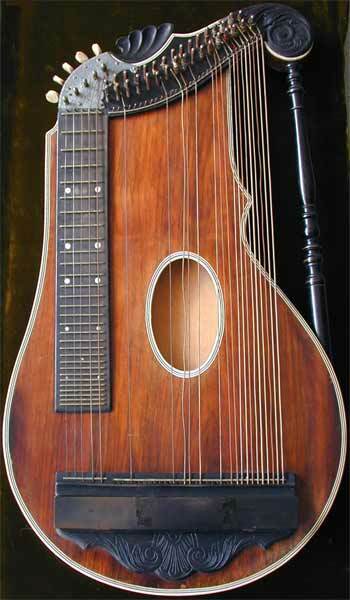 A Reform Cittern, Reformzither, rosewood top, spruce back, rosewood sides, very decorative ebonized scroll and pillar, 5 melody strings with enclosed tuners and 5 bone knobs, 33 accompaniment and other (reform) strings with steel pegs, stained fruitwood finger board with one raised zero fret and 29 raised frets, fancy stained fruitwood tail piece and bridge with a cover, total length 72 cm, scale 42.2 cm, width 38 cm, depth 3 cm. 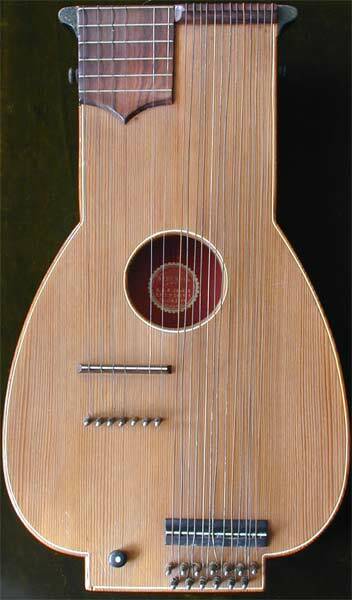 An attractive Schlagzither, Cittern bearing the original label: Sal. Trümpi, Zitternmacher, ??? Glarus (Switzerland), 1894. 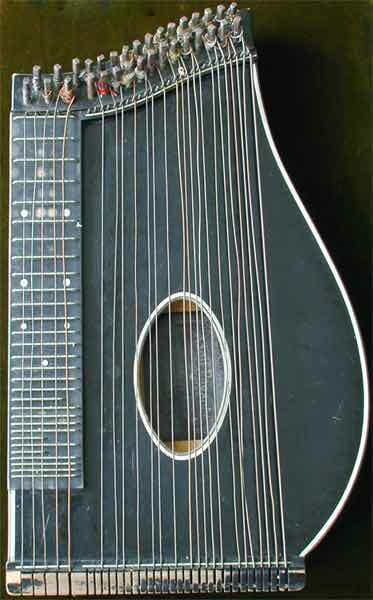 3 melody strings, 8 accompany strings (1 pin missing), top with a couple of small hairline cracks, back with no cracks, flamed maple sides, fingerboard with 18 metal frets (6 missing), metal nut, wooden bridge with metal saddle, 11 metal tuners, a few small old worm holes in the wooden nut of the accompany strings. 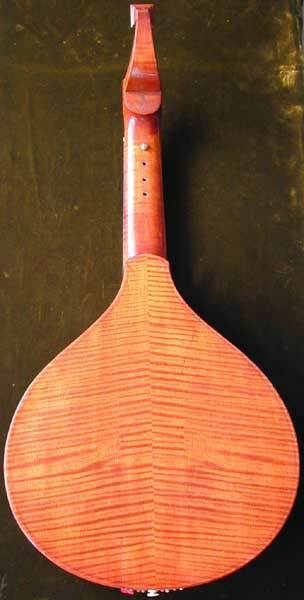 Rare antique Swiss neck cittern (Hals Zither), bearing the original label by the maker: Johan Zaugg, im ??? ?? ?, Signau ?? ?, 1829, and a repair label of: Avalle Paolo, Novi-Ligure, Fabbrica e Reparazioni, 1949, Istrumenti Corda, Rep. Pine top with several repaired cracks and purfling in the top, double rosette probably made from parchment and painted in gold color (top one missing), plain back and sides with some repairs, fruitwood neck and peg head with carved womans head also painted, 10 pegs, stained fruitwood finger board with bone nut and 13 brass frets, stained fruitwood bridge with a bone insert, total length 80 cm, scale 64.3 cm, width 27.3 cm, depth at neck joint 7.8 cm, depth at the bottom 6.2 cm, nut 4.6 cm. A rare Schlag Zither, hand made by the luthier himself (pre factory), bearing the original label: Georg Tiefenbrunner, Saiten Instrumentenmacher in Munchen 1849. Total length 22 inches, comes with a nice original wooden case lined with leather, lock in working condition with key. Some repaired cracks in the front and back. Piccolo Schlag ev. Terz Zither (pretty small) bearing the original label: Adolf Peasold, Carl Paesold's Son, Musikinstrumenten & Saiten Fabrik, Fleissen, b. Eger, Böhmen. Ebonized fruitwood top, back and sides ebonized spruce, 5 melody strings, 29 accompanying strings with metal pegs, ebonized fruitwood finger board with 1 raised zero fret and 29 raised frets, ebonized fruitwood bridge, in original wooden case, total length 44.2 cm, scale 32.8 cm, width 26 cm, depth 2.8 cm. 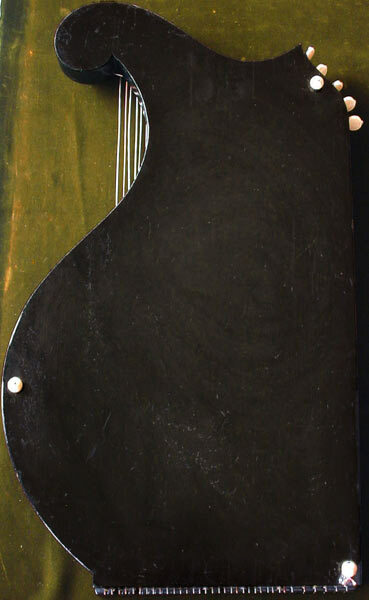 Terz Zither or Child's Cittern (quite small), bearing the original label: Guitar Zither made in Germany around 1900. 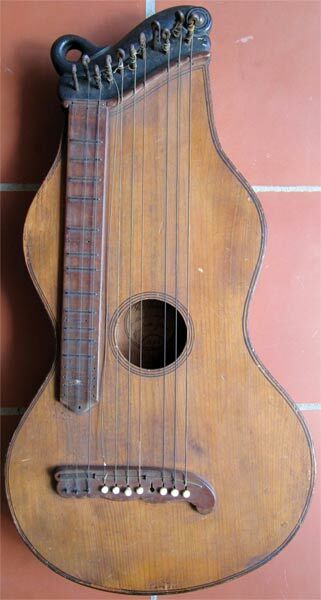 Stained fruitwood top, pine back and sides, 27 strings with metal pegs, total length 41.3 cm, scale of longest string 33.5 cm, scale of shortest string 15.2 cm, width 23.3 cm, depth 3.4 cm. 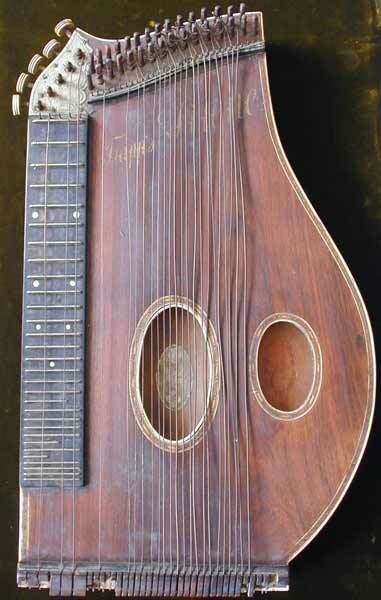 A Kinder Zither or Child's Cittern (pretty small) from around the 1880s. Curly maple top with some painted flower decorations and rosewood edging, top has a surface crack (24 cm), curly maple back with rosewood edges, sides with bone or bone inserts with painted emblame, 10 brass pegs, total length 37.8 cm, width 17.8 cm, depth 2.6 cm. Arch Cittern, Theorbenzister, spruce top with 4 repaired cracks, maple back and sides in good condition, stained maple neck and double peg head, 11 ebony pegs and 5 ebony sympathetic sting pegs, ebony finger board with two bone nuts and 17 brass frets, ebony and bone bridge, low action, plays good, total length 109.5 cm, scale 49.4 cm, width 31.2 cm, depth at the neck joint 8 cm, depth at the bottom 11.2 cm, nut 5.8 cm. 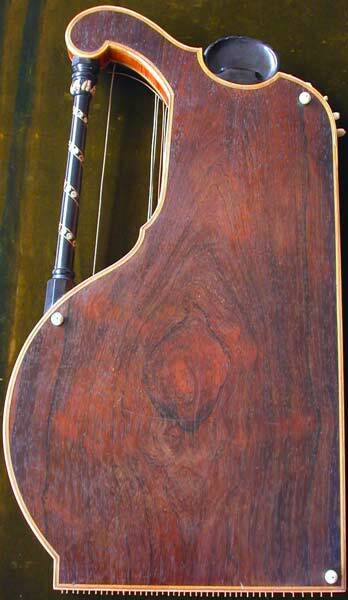 Viola da Gamba Cittern, Streichzither,inscribed inside: Made in London 1762, R. D.. Spruce top with several repaired hairline cracks one over the sound post, one piece flamed maple back in good condition, top and back with painted purfling, flamed maple sides, maple neck and head, head with enclosed brass machine heads and tortoise shell square at the top, original ebony finger board with bone nut, ebony tail piece, total length 64 cm, scale 33 cm, length from neck joint to middle of the f hole (f hole markers) 18.8 cm, length of back 38.6 cm, upper bout 17.9 cm, middle bout 12.8 cm, lower bout 22.7 cm, rim 4..3 cm, nut 4 cm. 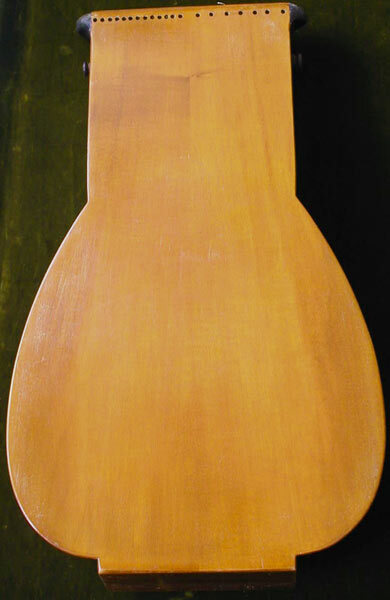 Strike Cittern, Schlagzither, solid spruce top slightly curved inwards, hairline crack from the end of the fingerboard to the bridge (8.5 cm), cedar back and sides, probably oak scroll, 4 melody strings, 10 sympathetic strings, rosewood or stained fruitwood bridge and nut with each a brass saddle, fingerboard probably stained fruitwood with 15 brass frets, steel pegs, total length 61 cm, scale 41.7 cm, width 29.5 cm, depth 4.2 cm. Concert Cittern, Konzertzither, bearing the original label of: Saiten & Musikinstrumenten Fabrik, Hermann Trapp. 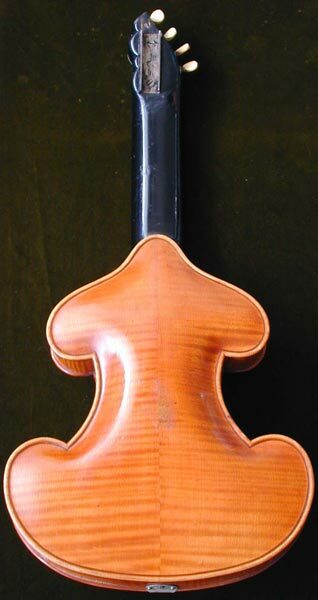 Wildstein a. Eger in Böhmen, also bearing a stamp in the second sound hole: D. R. Patent No 86768, K. K. Öster Patent No 4060/45, G. M. Sch. In allen Staaten. 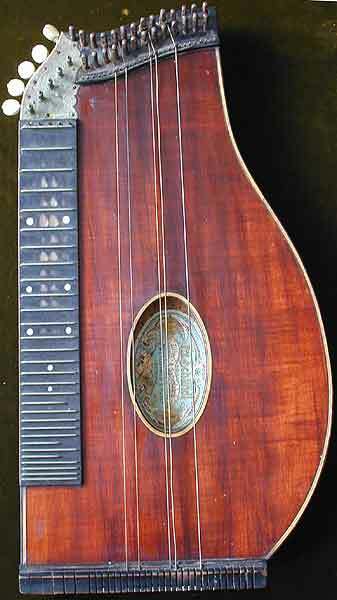 Rosewood top and written in gold: Trapp Zittern, two fancy sound holes with nice bindings, underneath the second sound hole is an angled second sound board bearing the stamp, back made from ebonized spruce with a sound hole showing with a second sound board about 1 cm away from the back, rosewood sides with one sound hole, some missing purfling at the top 2 cm, 5 melody strings with enclosed tuners with fancy bone knobs, 33 sinthethetic strings with steel pegs, finger board probably stained fruit wood with 29 raised frets, probably stained fruit wood bridge with some missing teeth, total length 56 cm, scale 41.4 cm, width 32.7 cm, depth 4.4 cm. Violin Cittern, Streichmelodeon, comes with a photocopy of the sales brochure which shows the exact picture of the instrument. 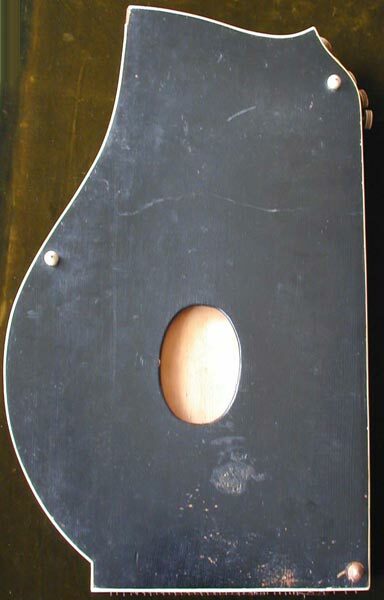 Spruce top with two repaired cracks (9 cm, 10 cm), flamed maple back and sides, enclosed machine heads with bone tuners, stained fruitwood finger board with a raised zero fret and 29 raised metal frets, in original wooden coffin case, total length 60.5 cm, scale 39 cm, width 27.7 cm, depth 4 cm, nut 6 cm. Doorbell Cittern, Thürzither, bearing the original label: Oellers Thürzitter, Gesetzlich geschützt!. 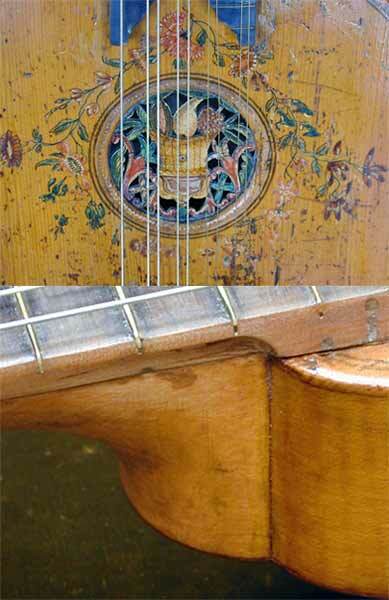 Stained fruitwood top with a portrait of Mozart on the top half and his name on the bottom half with some flower decorations, in the sound hole there is a edged and painted picture of a German castle, pine back, 7 steel pegs and 7 strings. 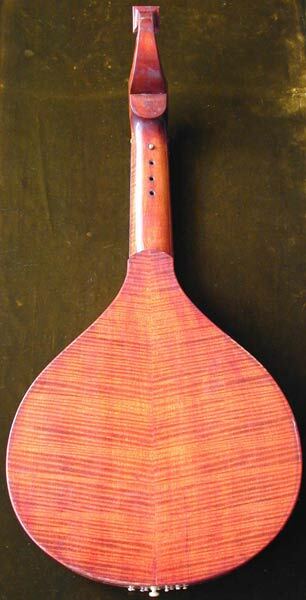 This cittern was used as a door bell: at the top there were 7 strings attached with wooden balls at the ends which played random melodies triggered when the door opened, total length 50 cm, width 34.5 cm, depth 3 cm. Concert Cittern, Konzertzither bearing the original label: Saiten & Instrumenten Fabrik, A. F. Kochendörfer, Stuttgart, also stamped at the top of the fingerboard: A. F. Kochendörfer, Stuttgart. 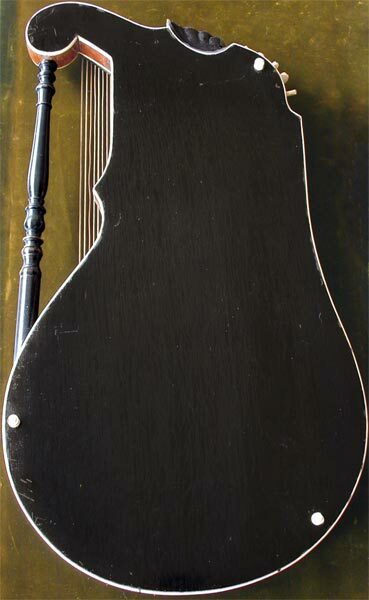 Rosewood top, spruce back and sides, ebony scroll with carved flower decoration, 5 melody strings with enclosed tuners with bone knobs, 30 accompaniment strings with metal pegs, ebony finger board with a raised zero fret and 29 raised frets, ebony bridge with some missing teeth, including original wooden case, total length 59 cm, scale 41.6 cm, width 32.7 cm, depth 3.1 cm. Concert Cittern, Konzertzither, bearing the original label: Franz Halbmeier, Saiten-Instrumentenmacher, Göthestr 3 und Bayer Str., München. 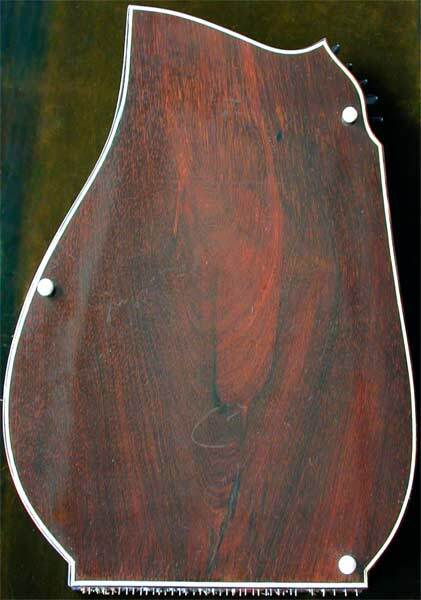 Rosewood top with two sound holes, rosewood back with one hairline crack (10 cm), reddish Brazilian rosewood sides and peg box, 5 melody strings with enclosed machine heads, 33 accompaniment strings with metal pegs, ebony finger board with a raised zero fret and 29 raised frets in good condition, ebony bridge, 3 bone feet, total length 60 cm, scale 43 cm, width 37.8 cm, depth 2.8 cm. Concert Harp Cittern, Konzertharfenzither bearing the original label of: Franz Schwarzer, Washington MO, Vienna 1873 1st price metal, Weltausstellung 1873 Vien. Brazilian rosewood top and back, reddish Brazilian rosewood sides, rosewood and ebony scroll decorated with flower design, lots of mother of pearl and bone inlays and bindings, 5 melody strings with enclosed gold plated machine heads with bone tuners, 41 sinthethetic strings with steel pegs, ebony finger board with mother of pearl emblame, 1 raised-zero fret and 29 raised metal frets all in good condition, bridge made of rosewood and ebony, in wooden luxury case with bone key hole cover and bone capo adapter and cleaning device with bone handle, total length 65 cm, scale 37.7 cm, width 35 cm, depth 3.5 cm. 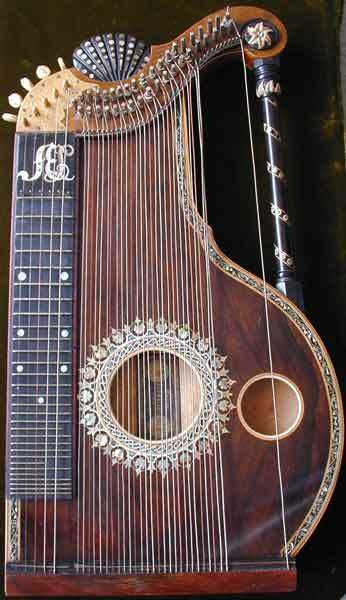 The 19th century world award winning zither luthier Franz Schwarzer lived and worked in Washington, MO. While in Missouri, you can visit the Franz Schwarzer zither exhibit in the state museum, that is where this zither maker set up his shop around 1870. 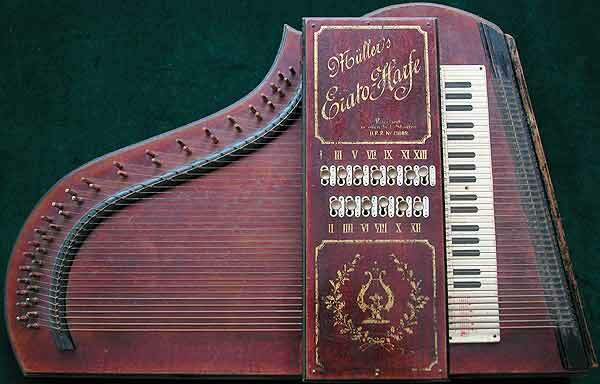 In 1885 Schwarzer invented the harp-zither, a different body style featuring a pillar (a harp-like column) inserted into the exaggerated s-curve on the far side. His fanciest model was so unbelievably ornate and intricately inlaid that it cost as much as a house of the same period. Konzert Zither or Concert Cittern bearing the original label: Frz. Schandl, Zither- & Saitenfabrik, Mittenwald a. d. Jsar (Bayern). 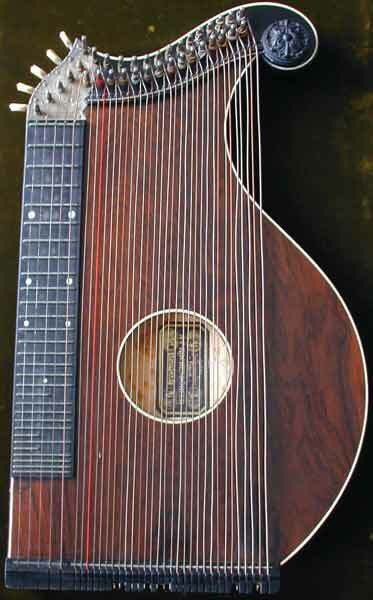 Rosewood or stained fruitwood top, ebonized spruce back and sides, 5 melody strings with enclosed tuners and bone knobs, 27 other strings with steel pegs, stained fruitwood finger board with one raised zero fret and 29 raised steel frets, stained fruit wood bridge, total length 57 cm, scale 41.4 cm, width 29 cm, depth 2.8 cm. 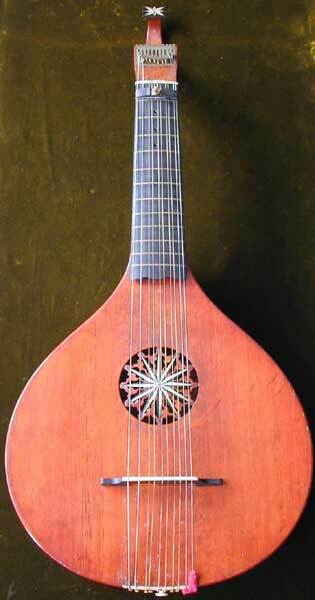 A very important 9 course (18 strings) Halszither - Neck Cittern, inscribed on the top, left and right above the bridge, in red paint: Iohan Vlrich - Schys - 1759. 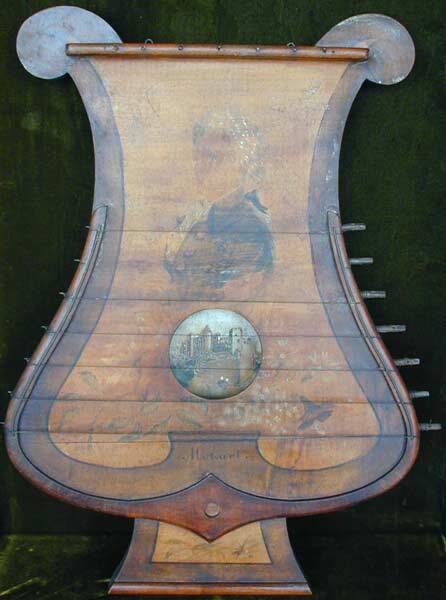 Top decorated with people, cupid and flower motifs, 2 small soundholes and 1 large with rosette, 4 unrepaired hairline cracks and a few small, old worm holes. Back center seam open, 3 small hairline cracks, loose from the sides in some places, sides with 3 unrepaired hairline cracks and a few small, old worm holes, neck with some drilled holes all the way through (for capo, maybe not original), fingerboard with 12 brass frets, neck with 8 wooden pegs, wooden bridge with brass saddle, brass nut. English Guitar, Cittern, Zither, spruce top with several repaired cracks and painted purfling, bone and maple rosette in good condition, flamed maple back with one repaired hairline crack of (13 cm) and the center seam partly open, painted purfling, flamed maple sides in good condition, flamed maple neck and peg head top inlayed with bone and ebony, 10 non original rosewood pegs, ebony finger board with bone nut and 12 brass frets and with a brass and ebony capo, ebony and bone bridge, total length 74 cm, scale 42 cm, width 30.3 cm, depth at the neck joint 6.8 cm, depth at the bottom 8 cm, nut 4.9 cm. English Cittern stamped at the top of the back: C. Mason. Also signed by the maker and dated: 1757. Spruce top with colorful flower decoration around the sound hole, carved wooden flower rosette, painted purfling, one piece flamed maple back with several repaired worm runs, flamed maple sides with several repaired worm runs, maple baroque style neck and peg head, end of the peg head could be a later replacement, 9 non original rosewood pegs, straight neck, stained fruitwood finger board with bone nut and 17 brass frets, rosewood and bone bridge, total length 68 cm, scale 36 cm, width 25.8 cm, depth at the neck joint 4.2 cm, depth at the bottom 5.5 cm, nut 4.2 cm. English Guitar stamped on the back of the head: Preston London. Spruce top with several repaired hairline cracks with painted purfling, bone ebony and stained fruitwood rosette, flamed maple back with one repaired crack (5 cm) and painted purfling, flamed maple sides with one hairline crack (2 cm), flamed maple neck and peg head with brass enclosed machine head, machine head stamped: Preston Inventor, top of the head repaired and has an bone and ebony square plaque, ebony finger board with an bone nut and 12 brass frets, brass and ebony capo, ebony and bone bridge non original, total length 68 cm, scale 43, width 29.2 cm, depth at the neck joint 5.3 cm, depth at the bottom 7.4 cm, nut 4.8 cm. Nice violin zither bearing the original label: V. Bestgen, Bern, also stamped on the back at the neck joint: Bestgen zur Lyra, Bern, made around the 1870s. Spruce top with a repaired crack at the bottom (7 cm), flamed maple back and sides, maple neck and scroll, ebony finger board, pegs and tail piece, bone nut, 26 metal frets, in original case with a plaque of V. Bestgen, total length 59.5 cm, scale 33 cm, width 24 cm, depth 4 cm, nut 2.7 cm. Violin Zither or Cittern bearing the original label and directions to play on the inside of the case: Patent Zither Violina Registered August 6th, 1879, also stamped on the top of the cittern serial number 828 by Royal Letters Patent. It seems to be made of fruitwood with probably stained fruit wood finger board, bone zero fret, 29 bone frets, bridge is broken in half, this instrument is played with a bow, in original wooden box, total length 60.7 cm, scale 50 cm, width 6.9 cm, depth 3.5 cm. Epinet de Vosques, stained fruitwood top, back and sides, stained fruitwood peg head for five pegs, one broken off, 2 melody strings plus 3 other strings, 14 frets, total length 49 cm, scale 38.2 cm, width 7.5 cm, depth 2.6 cm. 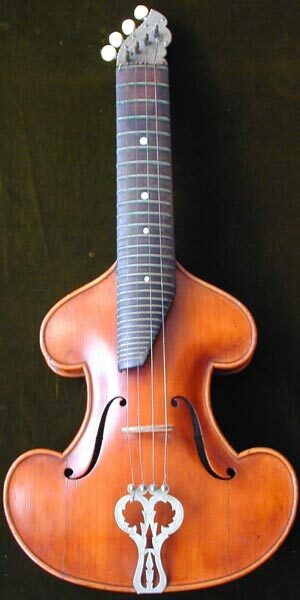 Viola or Streich Zither, Cittern, spruce top, flamed maple back and sides, enclosed machine heads with bone tuners, stained fruitwood finger board with one raised zero fret and 28 raised metal frets, in non original viola case, total length 60.5 cm, scale 36.8 cm, width 24.5 cm, depth 4 cm, nut 4 cm. Fado cittern or guitar bearing the original label: Joao Miguel Andrade, Fabrica e Armazem de Instrumentos de Corda, Guitarras Violins braguezas Cavacos, Lisboa, Rua nova de Trinidade, Sole Agents for Great Briten and Colonies, Alban Voigt & Co., 14 Edmund Place, London E. C.. Spruce top in good condition with ebony and fruitwood purfling, Brazilian rosewood back with two repaired cracks (30 cm, 6 cm), Brazilian rosewood sides with some small repairs but firm with two sound holes on the sides, neck and scroll in one piece with enclosed metal machineheads for 12 strings, straight ebony finger board with bone nut and 17 brass frets in good condition, bone and ebony bridge, this instrument is good to play and the action is set how it should be, total length 70 cm, scale 44 cm, width 28.7 cm, depth at the neck joint 6 cm, depth at the bottom 7.8 cm, nut 4.3 cm. 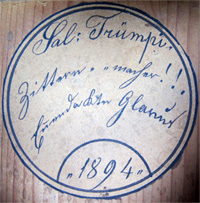 German Zither bearing the original handwritten label: Joseph Rieger, Geigenmacher in Mittenwald, an der Iser bei Tihrol. 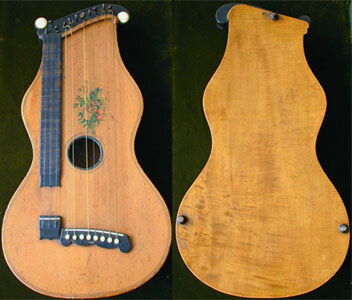 From around 1810, spruce top and back in very good condition, the two sound holes are covered with decorative parchment edgings, maple sides and scroll, four melody strings plus 13 other strings, fingerboard with fourteen frets, total length 49 cm, scale 33.8 cm, width 20.2 cm, depth 3.5 cm. South German Hals Zither bearing a label inside with the date of 1663 other wise not readable. Pine top with some barely visible old worm runs and cracks that have been restored, rosette of two toned parchment, painted purfling on top and back, back and sides of some fruitwood with some worm runs in the side, neck and peg head made of fruitwood, scroll of a carved animal head, 9 pegs probably original, stained fruitwood finger board with bone nut and 17 brass frets, stained fruitwood bridge, total length 72.6 cm, scale 43 cm, width 24 cm, depth neck joint 5.8 cm, depth bottom 3.9 cm, nut 4.4 cm. Giant antique Autoharp in the shape of an grandpiano. Müller's Erato-Harfe, Patentiert in allen Bundes Staaten, D.R.P.  No 75089. 12 keys each changeable 3 times and 1 key changes from diminshed to augmented. 37 discant strings and 6 bass strings, 38 chords. Total length 29 inches and 19 inches wide. Good condition, no cracks, body is straight. 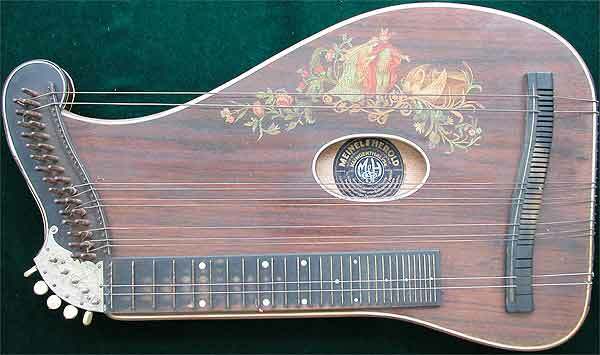 A good Konzert Harfen Zither or Concert Harp Cittern with a nice picture on the top, bearing the original label: Meinel & Herold Klingenthal. 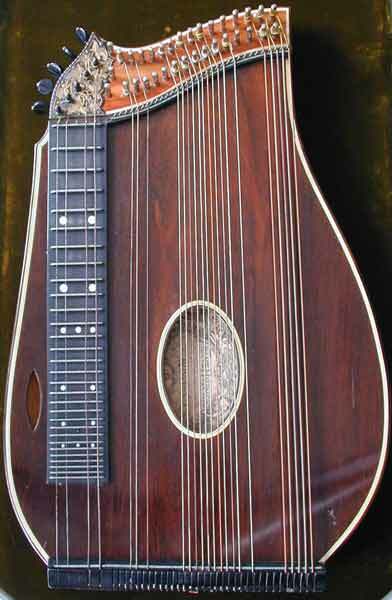 Total length 26 inches, scale 16 1/2 inches, one hairline crack in the back, some loose bindings, 1 inch of binding in the top missing, comes with original wooden case and string tuning tool. Free counters provided by Vendio.com. Instrument pictures are property of EarlyMusicalInstruments.com and Music-Treasures.com. Please, do not distribute or copy without written permission!